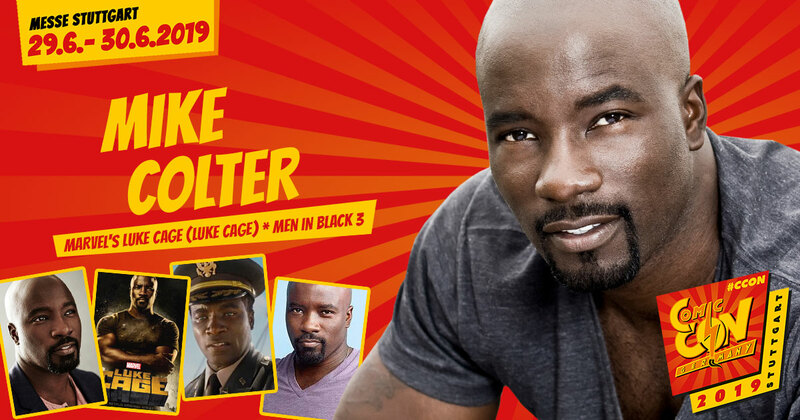 With Mike Colter, the Marvel Universe sends its first representative to CCON | COMIC CON GERMANY 2019. The actor born in Columbia (South Carolina, USA) is the leading actor in the Netflix series Marvel’s Luke Cage. Colter already slipped into the role of the hairdresser assistant Luke Cage from Harlem – who thanks to a failed experiment is equipped with superhuman powers and impenetrable skin – in the series Marvel’s Jessica Jones and Marvel’s The Defenders. In addition to many other series (including American Horror Story, The Following and Ringer), the expressive mime can also be seen in cinema productions such as Million Dollar Baby (2004) by and with Clint Eastwood, Men in Black 3 and most recently the science fiction thriller Extinction (2018). Mike Colter also feels at home on the theater stage. Look forward to seeing the likeable actor live on the CCON | COMIC CON GERMANY. Tickets are waiting for you in the Ticket-Shop. You are not able to join CCON | COMIC CON GERMANY, you are too busy or on vacation, but although you wanna get an autograph of your beloved actor? For that we invented our Send-in-Service. In our nerd shop - The Space Store - you can either order a standard autograph on a high-gloss photo, or you can send us your item (photo, poster, book, DVD, etc.) and we will have it signed by the star at the event.